About 400 St Augustine wrote the 'Confessions', which has been called 'a history of his heart', meaning that it is an extended praise of God acting within himself rather than a confession in the modern sense. Its interior, contemplative aspect made it an important work for medieval monks, whose lives revolved around prayer and contemplation. 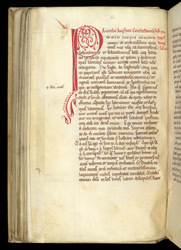 This 12th-century copy of it belonged to the priory of St Andrew, Rochester, according to an inscription on one of its pages. The monks there may have read this manuscript during their time for private reading and study. The edges of this page show the marks of many readers' fingers: the 'Confessions' was widely read in the middle ages. Book (or Section) Four covers Augustine's 19th through 28th years, when he followed the Manichaean religion and wrote books on the liberal arts and Aristotle--all totally condemnable in his mature estimation. The words in the left margin are the scribe's correction of his omission in the adjacent line.